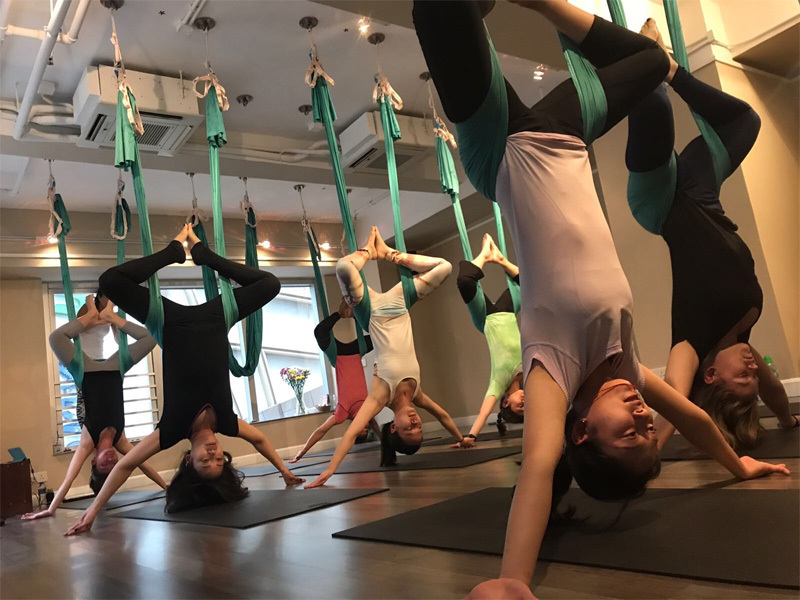 AntiGravity® Yoga combines traditional yoga poses and principles with elements from aerial arts, dance, gymnastics, Pilates, and calisthenics. Christopher Harrison’s AntiGravity was established in 1991 and with this technique one can obtain all of the benefits of yoga without the impact or strain required to achieve the same movements and positions on the ground. Using the principles of gravity to achieve physical and mental decompression, it allows practitioners to get in shape and realign their body in a playful environment. The philosophy of AntiGravity® takes into consideration the two meanings of the word anti-gravity. The first is to “defy the laws of physics” and, secondly, to take a stance “against graveness,” assuring that classes are fun! Christopher Harrison’s personal guarantee is that if you can “suspend your disbelief” his techniques will make you healthier, happier, and taller in your first session. This introductory course includes zero-compression inversions, suspended mobility, flexibility, and FUN! The movement is broken down incrementally, and is recommended for first timers and easy riders. Experience an enjoyable and FUN combination of agility, swinging, and accessible movement aimed towards opening and relaxing both body and mind. This class is suitable for complete beginners. When you Open Up space in the Body, you Open Up space in the mind. AntiGravity® Open Up class includes zero-compression inversions, suspended mobility, flexibility, core strengthening and FUN! 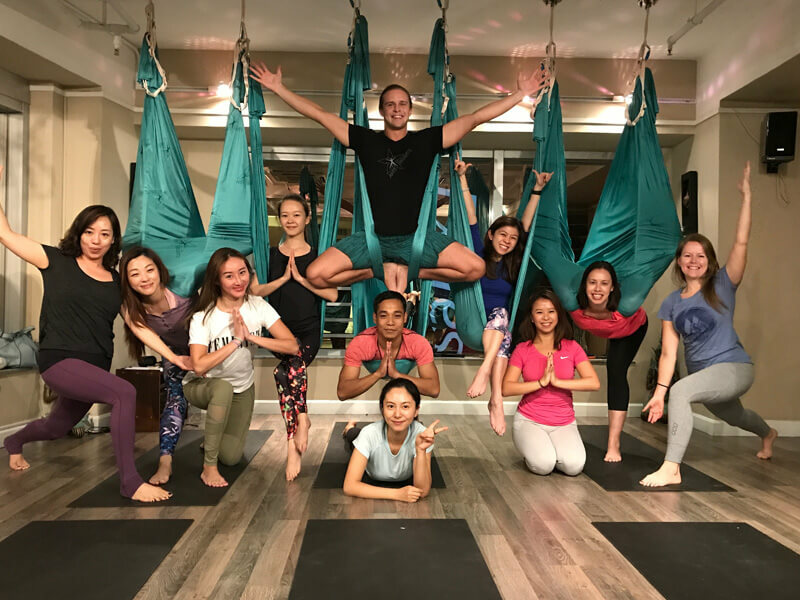 The movement is broken down incrementally, and is recommended for first timers and students who want to take their existing practice to new heights with Flying Shoulder stands made accessible on the Harrison Hammock. Experience an enjoyable combination of spinal decompression, strengthening, joint mobilizing and accessible movement aimed towards opening up both the body and mind. Explore moving in all directions of open space with the Harrison AntiGravity® Hammock as you swing and soar your way to greater health & well being. This class introduces you to meditation, pranayama, and asana postures, while focusing on building upper body strength, core strength, flexibility, mobility and including a variety of zero compression inversions. Open to all levels. AntiGravity® Restorative Yoga is the gentle, meditative, slow stretching and rehabilitative version of AG Aerial Yoga. This approach is perfect for those with a lower fitness level or who just like an approach that gives you time to tune in at a deep level. This unique method focuses the mind through powerful visualizations as you float through a series of gentle gyro-kinetic motions, deeply opening the entire spine, hips, and connective tissues of the body. This technique features full body inversions, alongside various forms of flowing spinal traction with the Harrison AntiGravity Hammock height is lowered much closer to the mat for greater accessibility and relaxation. AG Restorative Yoga is an excellent class for first timers. ~ For your comfort and to maintain cleanliness of hammocks we recommend a T-shirt with sleeves. This class focuses on stretching and releasing tension in the muscles with the support of the AntiGravity® hammock. With the help of gravity we can experience a deeper stretch in a more relaxing way. 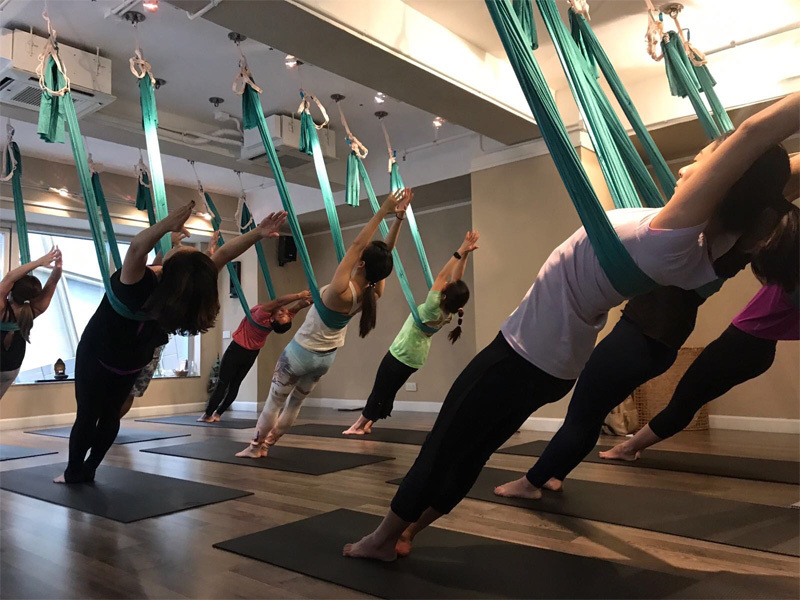 Students can also develop better balance and muscle control by using the support of the AntiGravity® hammock to balance and stretch in different yoga poses. There will be no inversions in this class and it is appropriate for all levels.